Tata Group belongs to a select club of Indian companies for whom constant learning and training is an article of faith. The Tata Management Training Centre (TMTC), the group’s apex leadership training centre in Pune is testimony to that commitment. The sprawling 15-acre campus in the heart of the city boasts of heritage buildings designed by George Wittet, who among other things built the iconic Gateway of India in Mumbai. The campus with 800-odd trees (several sandalwoods among them) is virtually a tropical forest in the middle of a bustling cityscape that offers the ideal environment for learning and contemplation. What sets the Tata Group apart is also its generosity in not just sharing the beautiful space, but also learning and knowledge, with others. 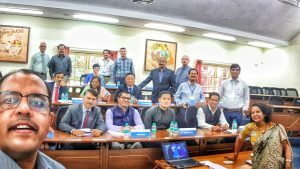 As part of its efforts at sharing knowledge, TMTC held a week-long training programme in November 2017 for nearly two dozen of India’s top policymakers, bureaucrats and senior police officers. We were thrilled to be invited by TMTC’s sagacious director Emmanuel David to conduct a session for the members of what is known as the steel frame of India on using social media to deliver innovative, pro-people governance in the 21st century. Social media is now a vital part of the foundation for a new form of democracy and citizens participation. In an overwhelmingly young nation such as India, social media has already become the primary source of information. Some 240 million Indians on Facebook making it the biggest user base for the country; 200 million on WhatsApp; and 30 million on Twitter. The various organs of the government must think of creative ways of using social media be it for making announcements, encouraging citizen participation or responding to feedback and criticism. We learned about some wonderfully innovative ways in which several bureaucrats were already using social media to curb crime, fight the spread of misinformation in rural regions and promote various welfare schemes. The agencies of the government and the employees who create those organisations often do amazing work that goes unnoticed. The work of government organisations is often judged by what they fail to do rather than things they do well. Like companies, governments too must use social media to shape their public image to reflect their true values and goals. It’s important that they show-off the good work. One of the many ways they could do that is by humanising their employees. Government is made of people just like a business or even a household. When citizens remember government is made of people like them making every day sacrifices and undergoing hardships, they become empathetic. And what better medium to do that than social!